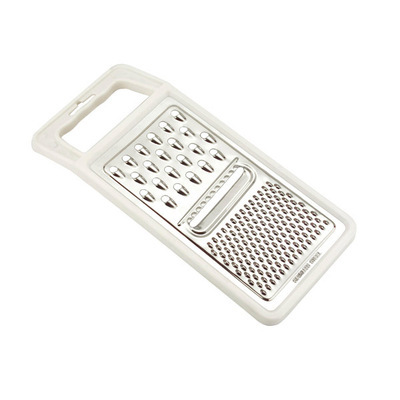 Home » Catering Supplies » Stainless Steel Grater 10"
Suitable for repeated and continual use, our Stainless Steel Grater has been designed for busy catering environments. The durable steel construction has a polished finish that can be re-established through minimal maintenance. It includes a white plastic surround for safety with a large, ergonomic handle which allows for comfortable use. The flattened grater can produce three different textures, from traditional grated flakes through to finer powders and slices. This catering tool is ideal for preparing a multitude of foods including cheese, carrots and ginger, for example. We have a wide range of Catering Supplies here at Gompels. You'll find everything from Adult Bibs to protect clothing through to identification Food Labels and Colour Coordinated Knives - all for exceptional wholesale prices.